We all know about supermarket frustration: you roll your full cart up to the first available cashier and unload your stuff only to find that she’s brand new and has no idea how to work the scanner. Not only that, but she has to ask you what every piece of produce is and then look up the codes to punch in. What should have been a quick trip to the supermarket ends up taking twice as long. New technology being developed by Toshiba Tec could put an end to that crazily frustrating game. The new Object Recognition Scanner uses a camera to recognize items rather than depending on barcodes and keyed-in codes. The camera is connected to a system that stores information about all of the products the store sells. Produce is recognized instantly – the camera can even tell the difference between different types of apples – and the correct price is added to the bill. 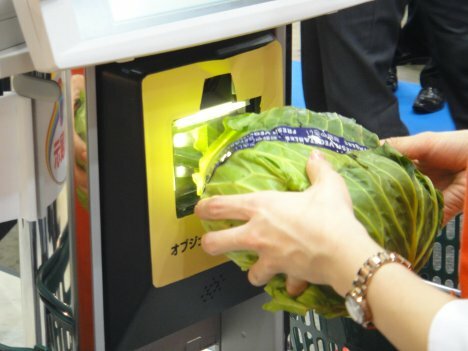 The system also recognizes pre-packaged items just like a standard scanner. 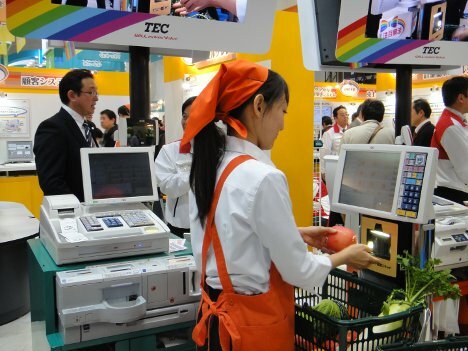 It would come pre-loaded with a database of fresh produce and other items to make the system easier to integrate into an existing store. The scanner operates at high speeds thanks to its ability to differentiate between items and “noise” in the picture. So even if the supermarket checker you get happens to be just four hours into her new job, you should be able to get out of there in a reasonable amount of time.